Welcome to Adventures in Parenting! Trying to get your kids off the computer? No need to nag. Use this! It’s only 2pm and my iPhone battery is already down to 28%. I hate it when that happens! I’m out running errands and can’t charge my phone. What if the battery runs out and I miss a call from my daughter at school? There could be some emergency and no one will be able to reach me. Magicstick is the solution! This slim charger fits in my purse, and even in my pocket. My phone, or other digital device, can be charged as fast as an electrical outlet. It only weighs a couple of ounces so it doesn’t weigh down my purse like a big bulky charger. I even use the Magicstick at home so I can be charging my phone while using it without being tied to the wall or my computer. I recharge the Magicstick at night, and it’s ready the next day. Next week when my daughter stays overnight at her friend’s house, she’ll be taking the Magicstick with her to charge her phone. It will give her up to two full charges before the charger needs to be recharged. 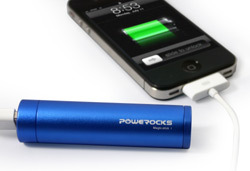 That’s enough for any overnight trip without having to worry about finding an outlet. Think camping or a day outing. Some cool features – brilliant fun colors to choose from; easy to use, no set up or complicated buttons to mess with; USB cable included; super light and easy to carry everywhere. There’s a battery indicator light. Click it and if it’s red, you better charge it. It’s better to just make it a habit to charge it every night so you’ll always have it ready. Just make sure you carry your own charging cable, which I put in the little bag that comes with the Magicstick. Disclosure: I was not compensated in any way to write this post except for a complimentary Magicstick for review. This is worth the 18 minutes of this TED talk. I like the family meeting concept.